Most of the colours that exist in foods change as those foods are subjected to the cooking process. Many food manufacturers add unnatural chemical food colourings to products to make them more attractive, especially to children. Recent work by authorities in the UK and USA has shown that there is a link between chemical food colourings and hyperactivity, especially in those diagnosed with ADHD. Despite limitations with the samplings used there are a number of products that have now been banned but as a general rule it is considered wise to avoid any foodstuff that is brightly coloured. No real surprises here but just refresh yourself that an average can of a cola, whether supermarket or one of the big brands is simply packed with sugar. A small 40g can of cola is packed with the equivalent of 10 cubes of sugar and as if that was not bad enough, recent changes in the soft drinks industry see manufacturers replacing sugar with corn syrup which has been linked to a “more you drink – more you want to drink” phenomenon. 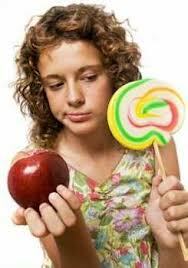 Early tests seem to show an addictive link to corn syrup that is similar in strength and nature to cocaine addiction. Despite all of the best marketing assertions of the food industry, fruit juice is not as healthy as you might expect. Fruit juice is a natural form of highly concentrated sugar. Natural it may be but it is sugar none the less. Sadly none of the other dietary benefits, such as fibre, are found in fruit juice as they are all thrown out with the fruit pulp after the juice has been extracted. Fruit juice consumption is regularly linked with studies of child obesity and children should be encouraged to drink water. Keeping a bottle of fresh tap water chilled and in the fridge is a good way of quenching young thirsts. Processed meals are the other major food that you should never feed your child. Routinely they are high in levels of the big three. Salt, sugar and fat are the enemies of all children as far as a healthy diet is concerned and these are the three ingredients food processors add to improve “taste”. Beware the misleading packaging as well, an item that is labelled as low fat can still be high salt and high sugar and you should also remember that any food stuff that is high in carbohydrates can also be a way of sneaking high levels of sugar into your child’s diet because carbohydrates metabolise into sugars as food is digested.